Welcome back to Camp Fire. Please take a moment to complete this alumni survey. Thank you! A Northwest institution since 1924, Camp Namanu is a 552-acre property located an hour east of Portland on the shoulder of Mt. Hood. 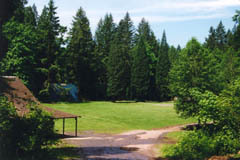 From this venerable site, Camp Fire operates a residential camp for 6-17 year olds each Summer, as well as during Autumn Weekends and Spring Break Week. The purpose of this site is to share with others the rich history of Camp Namanu and to help bring together alumni in an effort to support the work of Camp Fire USA Portland Metro Council. For questions concerning the business operations of Camp Namanu including camp registration and rental of camp facilities, please visit the web-site of Camp Fire USA Portland Metro Council.